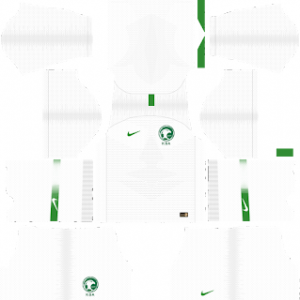 In this article, you can find and download Dream League Soccer (DLS) Saudi Arabia kits and Logos 2018, 2019 Edition with URLs. Saudi Arabia is one of the famous football team in Asia. The National team didn’t any good record in Football world cups. It was founded in 1956. The team is ranking at 12th position in 1994 Football World Cup and become a runner-up in 1992 FIFA Confederations Cup. The Saudi Arabia National Team won Arab Nations cup twice in 1998, 2002, and runner in 1992. Their best record in AFC Asian Cup is winning the tournament thrice and runner-up 3 times. Saudi Arabia wins one silver and bronze medal in Asian Games and also considered as a very successful team in Arabian Gulf Cup. The Saudi Arabia 2018-2019 kits for Dream League Soccer includes the whole package. It includes home kits, away and Goalkeeper kits. The kits and logo are present in the size of 512×512. 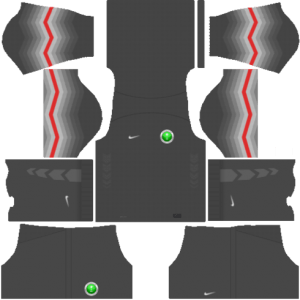 Download the Saudi Araba Dream League Soccer kits from below. This attractive home kit is painted bright white and completed with green trimmings. You wear this and feel inspired to play well for this great team in Dream League Soccer Game. Saudi’s Away Kits comes in the country’s national flag color. 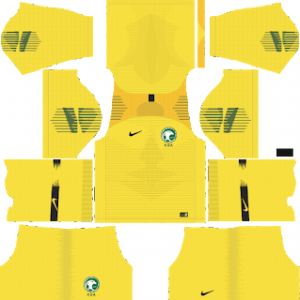 This jersey is full of green and also some white shades which are based on the same design of the home kit. Click this URL to download the kit. The Saudi Arabia Goalkeeper Home kits are very cool and also different from the whole team. It comes in dark black and red shade and logo on it. The Goalkeeper away kits 2018 come in a bright yellow color, so it attracts more. You can use this for your Saudi Arabia team in Dream League Soccer Game. The logo is light green in color with a design in the middle. 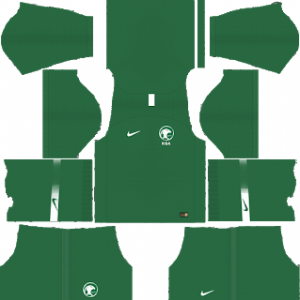 The design is of a tree, Saudi National Football Team is written at the bottom.